You have requested further details about Riverside House, at present the details we have are as follows. Riverside House offers excellent value bed and breakfast accommodation close to the historic market town of Cirencester. We offer a warm and relaxed environment with a fully licensed restaurant and bar. 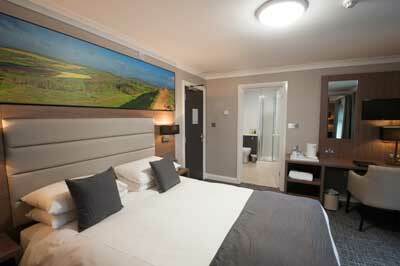 Our 24 guest bedrooms have been fully modernised. All include stylish en-suite bathrooms, new beds, flat screen TV, hospitality tray, free Wi-Fi and free secure parking. Please note all our rooms are accessed by stairs. We do not have a lift. Only a 15 minute walk and you are in the centre of Cirencester, with its unique range of shops, galleries, bars and cafés. Riverside House is based at Mitsubishi Motors UK headquarters. There are excellent road links and easy access to the M4 and M5. Riverside House makes an ideal base to explore the Cotswolds. Burford, Cheltenham, Bibury and Tetbury are only a short drive away. Single rooms from £60.00 per night and double rooms from £75.00 per night. Group discounts are available for clubs and societies.